PediSpaTM Detox Foot Soak infused with black charcoal deeply cleanses and preps feet for the pedicure while calming and relieving the skin. Black charcoal is a highly effective detoxifying ingredient. It works by behaving like a magnet, attracting and absorbing thousands of times its own weigh in dirt, oil, and impurities. Specifically formulated for use in hydrotherapy and foot baths, this non-foaming, residue-free foot soak will clean and soften the skin allowing for fast, yet gentle exfoliation of calluses and cuticles. Cool off those tired feet with this refreshing pedicure. Cucumbers have the ability to help reduce water retention and swelling due to the large amounts of ascorbic acid. The abundance of antioxidants and silica in cucumbers will leave skin rejuvenated. Combined with a natural honey blend exfoliant, your feet will be left with a radiant glow. Green tea has high amounts of antioxidants as well as enzymes and amino acids that clinically delay the aging of skin cells, allowing visibly healthy, younger looking skin. Feet are soaked in a green tea bath before being exfoliated with a green tea and natural honey blend scrub. Skin will feel tighter and feet will be left feeling smoother. Our special blend Skinmilk and honey exfoliant will moisturize and improve the skin tone. Milk hydrates dry skin, exfoliates mature skin and soothes irritated skin. Our milk and honey blend will exfoliate deep into the tissues and get rid of unwanted dead skin cells. Our creamy lotion blend will leave skin feeling smoother, softer and moisturized. Indulge in this creamy aromatic pedicure. Feet will be exfoliated with a special blend of our signature skin milk and very fine sugar scrub, which help remove dry, rough skin while softening the cuticles. Followed by a crème blend mask used to relax muscles and relieve tension. Relax your feet with this citrus blend pedicure. Feet will be soaked in an aromatic flower bath. The citric acid present in limes used will slough off dead skin cells. Followed by a tangerine exfoliant and crème mask, skin and feet will be left feeling fresh and tingly. Rest your mind and your feet with this heavenly scented pedicure. 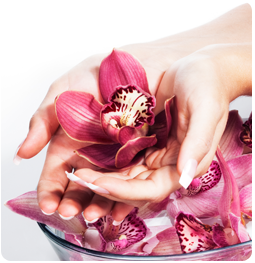 Lavender oil is an essential item used in this pedicure. It has the ability to eliminate nervous tension, relieve muscle pain, enhance blood circulation and treat respiratory problems. This pedicure is one of the most calming and stress relieving. Rejuvenate and revitalize your feet with this citrus filled pedicure. Orange slices used in this treatment gently exfoliate the skin to reveal a brighter complexion. Orange is rich in citric acid and packed full of vitamin C, which helps increase the production of collagen and keeps the skin firm and moist. Deeply nourishes and evens skin tine to renew skin’s healthy texture and appearance. Wrinkles are reduced and the skin is left glowing, radiant and youthful..